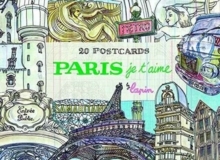 These 20 postcards are a declaration of love to the city of light. Lapin, sketcher and illustrator, offers a sample of his talent to capture those big little moments of a popular and vivacious Paris, full of historic contrasts and far away from any predictable cliches. From the terrace of a small cafe, with his water colours and his vintage accounting book turned into a drawing notepad, the artist contemplates the everyday life of the busy Parisians. His drawings show us a very personal urban landscape, a Paris of rendezvous, of tucked away corners, of bistro menus and walks by the Seine. 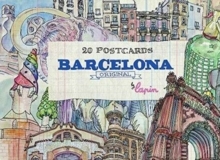 Lapin shares with the world the unique perspective of an artist in love with his city and presents us with the genuine and eternal spirit of Paris. "